Why are Oak Trees Declining in Maryland? Many have wondered why oak trees are declining and dying in Maryland. Oak Wilt seems to be the first disease that comes to people’s minds when they hear of Oak Death, however it’s helpful to know that, to date, Oak Wilt is not a disease that has been documented as affecting trees in Maryland. However, two common diseases that affect the oaks in Maryland are oak anthracnose and bacterial leaf scorch of oak. Oak anthracnose is caused by a fungal pathogen, Apiognomonia quercina. It is most prevalent during cool, wet weather, during springtime. If the summer proves to be wet and cool, then the symptoms may continue all the way through the season. Throughout the forest, most oak species will display a wide range of symptoms, which range from small brown spots and irregular dead areas on distorted leaves to severe blight that destroys twigs and shrivels leaves. Leaf drop is not typically prevalent from this disease. A disease which isn’t known to exist in most counties in Maryland is called Oak Wilt. It is due to the prevalence of a fungal pathogen named Ceratocystis fagacearum. This virus causes a blockage of the water and nutrient “circulatory system” of the oak tree, basically a vascular infection. It is most commonplace in red, scarlet, black, and pin oaks. Oak wilt is spread by root grafts, so you will find that it will affect a group of trees that is closely spaced. If the disease is spread more widely, than it is probably due to sap beetle feeding. 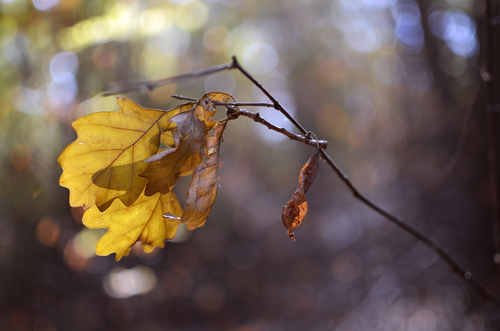 Oak Wilt will be visible by an abrupt distinction of color in the leaves, green and brown. The symptoms generally appear in the spring and early summer starting in the top of the tree. By mid-summer, you will see extensive leaf drop. If you notice on your property trees that seem to have the symptoms of Oak anthracnose or Bacterial leaf scorch, then call Calvert County Tree Services for an evaluation. You don’t want the diseases from one bad tree spreading to all of your trees on your property! So make sure to be cautious and call right away!